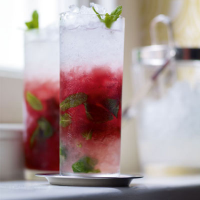 Try a raspberry Mojito too; swap a handful of raspberries for the liqueur and double the quantity of rum. Lightly muddle the mint leaves, lime juice and sugar at the bottom of a tall glass. Add crushed ice to half fill the glass. Pour over the rum and liqueur and stir lightly. Add more ice to fill the glass and top with soda water. Garnish with the mint sprig. This recipe was first published in June 2012.